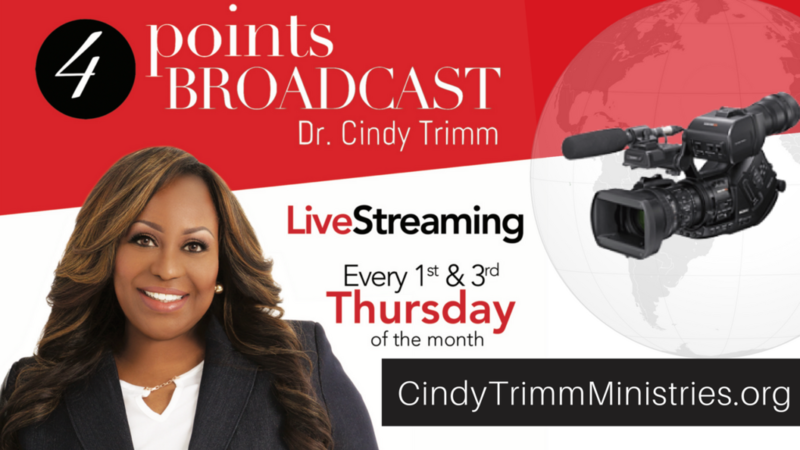 New “4 Points Broadcast” Live Streaming! When we awake to the reality of the spiritual battles going on all around us, we immediately realize there are massive assaults being leveled at our loved ones, communities, our churches, and our nations. I believe that God has called me to be a voice of hope and reason to the nations during these turbulent times. That is why I am going to utilize the power of technology to touch the four corners of the earth through Live Streaming! To that end we are excited to announce the launch of our 4 Points Broadcast! We will be streaming live every 1st and 3rd Thursday from this website. Just click the “Watch Live” tab at the top of this site or visit cindytrimmministries.churchonline.org. Join us as we stand watch together to see what the Lord would say to His people in this hour. This is not a time to wait for the next missile launch, the next sabotage attempt, or the next “hitman” to be deployed before you spring into action. Join me every third Sunday as we press into God’s command center—the Throne Room of Heaven—and receive our directives from the Commander-in-Chief of the universe. Then, as we hear, we will know how to answer. We will know how to course correct as we occupy new territory in advancing the Kingdom of God. He goes on to instruct him to “wait for it, because it will surely come…it will speak, and it will not lie” (Habakkuk 2:3). A vision inspired of God is a powerful tool—a powerful weapon we can wield in the war on darkness. A vision gives light, understanding, purpose, and clarity. When you can see a desired result in your mind’s eye, a divine outcome that God has put before you, you can move boldly in that direction. You can run with it! In the very next verse of this passage is where we read, “the just shall live by faith” (Habakkuk 2:4). A vision, simply put, stirs your faith. You can’t “call those things which be not as though they were” (see Romans 4:17) if you can’t first envision those things. Get God’s big, bold vision for you. Grasp hold of the power you have to foil the enemy’s plans—to champion a good cause and not allow evil to thrive unopposed. God is a God of big vision. Be a person of big vision. Don’t allow Satan’s plans to come to pass! Not today. Not on your watch. Not ever. Enforce the original plans and purposes of God over and above any plan of the enemy to do you or those you love harm—and then widen the circle of those you love! Every attack leveled against humanity opens a door of opportunity to plunder the enemy’s territory instead of the other way around. God has given you the power to shut down every initiative instituted by anyone or anything that moves by satanic impulse. Their provocations to attack you shall serve you instead! This is the inheritance of the Lord that will propel you in fervent determination to battle in prayer. God hates what the enemy does to His people. When you war on behalf of your family and friends, nation and the world, war with a righteous passion—a passion born out of a love for God and for everything He created on this earth. With the love of God as a constant companion, passion speaks to the depth of our love returned to God, no matter where we are in our prayer journey. When you are in a temporary place of separation for the sake of personal growth or sanctification, whether in a winter season, desert time, or other isolating trial, your total dedication to the process of prayer and your reliance on God will deepen your walk. As you rely on Him alone—trust in Him alone—He becomes your salvation in new and wonderful ways. The God who saved you has equipped you for and before each and every battle. The art of war begins with securing the lines before pressing into an offensive against the gates of hell. If you watch the nightly news, you learn that major ministries tend to fail because of things that are within their own borders of authority—not because they have been overcome by reaching out to take new territory for God. Ministers fall into sexual sin because they have not taken the proper precautions to guard themselves against it—or their finances fail because they do not discipline their spending or accounting procedures properly. Many fail because they fall into pride and it opens them to all kinds of difficulties. Defeat comes because they have not properly guarded their hearts or their homes, not because they have not launched the proper offensives. It’s so important to order your own house, beginning with your own soul, before taking any fight to the streets—or to the front lines of the world’s battles. The first priority of spiritual war, therefore, is to humble yourself before the mighty hand of God (1 Peter 5:6). Walk in the Spirit so you do not fulfill the lust of the flesh (Galatians 5:16). Once the borders of your domain are secured, only then can you think about taking the fight to the enemy. Stand your watch and set yourself on the rampart of your life—and then watch to see what He says to you! P.S. Don’t forget to tune in every 1st and 3rd Thursday as we livestream our all new 4 Points Broadcast!